Let me disagree. You could smooth the edges of existing sprites. Besides the infantry is not static. You could do a lot. OK I lack the skills for the latter-it would require he skills of a master artist. 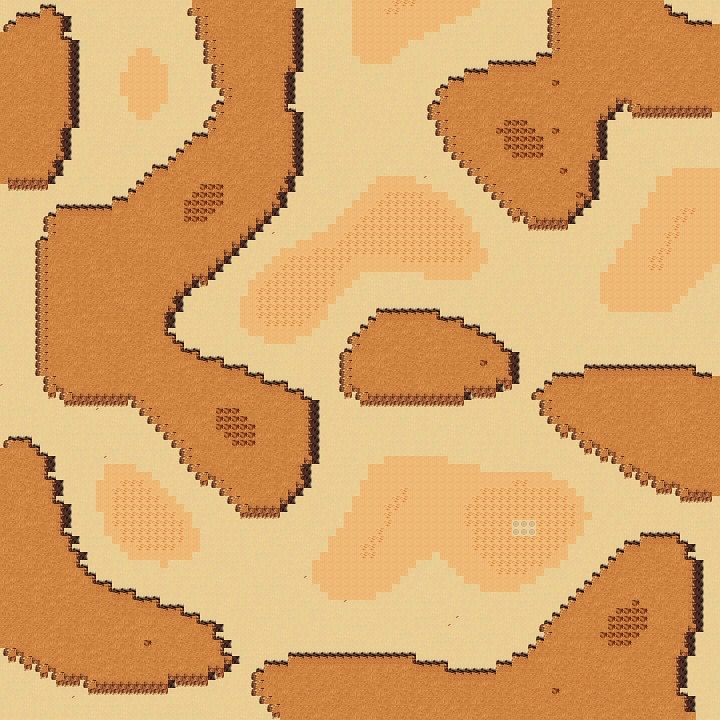 Here is my attempt at auto map generation. However, I don't think it will be finished, I'm kinda clueless to how I'm going to make the edges look decent. Yooo, sick, dude! 😮 You just draw those? I agree about the DHM, that should be laid on its side or buried diagonally in the sand. I really like the wrecked Devastator, that's pretty cool. I used the normal devastator image, removed the 'bottom' and corrected the colours, because all the old abandoned (destroyed) stuff gets a more sand colour. 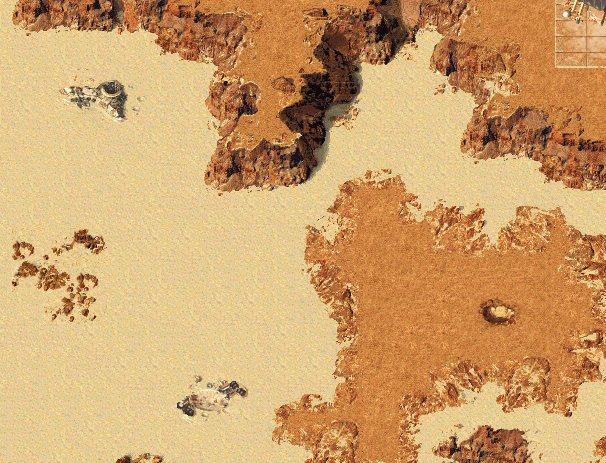 Also added some shadow and lost pixels/dust/sand with the clone/stamp tool in Gimp. 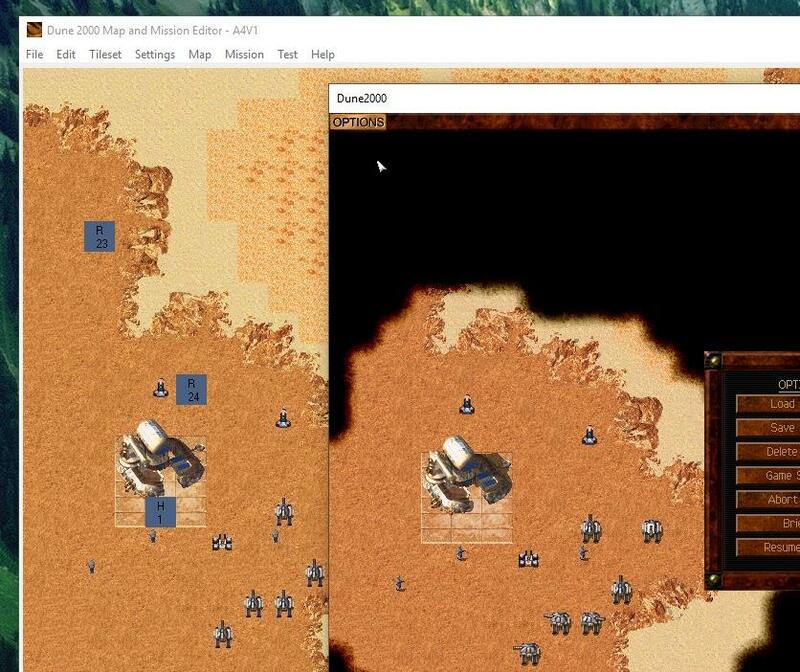 Do you perhaps also know why(/how/what) there is a difference in colours between exported images and the game itself. In-game has more red in the images it seems. And, yep! The in-game graphics are processed through various filters. In the Resource Editor, you can view the palettes on the side. I believe these are the filters. If you replace three different sprites with one image, each one will have a slightly different coloration. It's not too difficult to work around the recoloration, but it does take a little extra effort since you've gotta have the right grays to pick from. 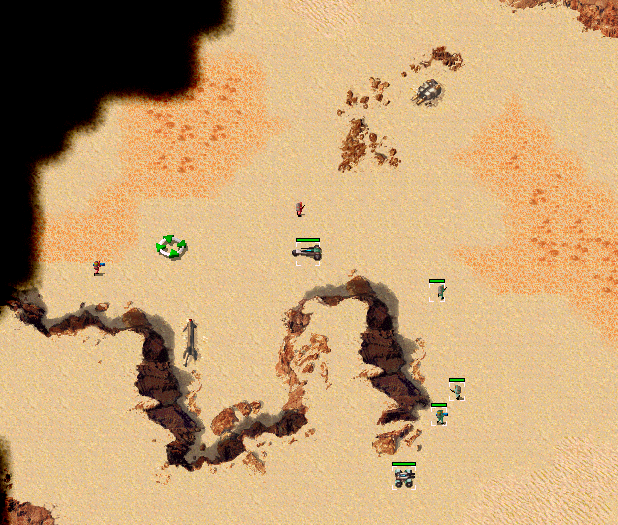 I could only overwrite the Harkonnen body because that's what the sprites are built for. If I tried overwriting the Atreides or Ordos bodies, the stripes on the side of the CT body that are meant to become the House color would just show up as gray in-game since the different palettes used by those spritesets don't register the same shades of gray on the Harkonnen CT body as being House colors. The advantage of working with tilesets is that you only have to go through the .r8 / .r16 filtering, and there's no worrying about the transparency / shadows / House colors being changed randomly because there are none that need to be accounted for. Things will, however, look a little different in-game. You can see a filter very, very clearly if you look at the raw .bmp file of a tileset and the version stored in the equivalent .r8 file by comparison. .r16 is more subtle, but it's there too. Drawn up from scratch by a relative of mine. I touched it up and adjusted it for in-game. It doesn't have a damaged sprite yet, but you've got the lion's head, the mane makes up the roundness of the structure, the House colors on the side and in the eyes, the doorway's in the pixel-perfect spot compared to the other Barracks, and although the shadows in that screenshot are screwy, they've since been updated along with the lighting. Thanks! The debris is a piece of a starport or not, it could be anything. The crater was made by adjusting a crater from the (white) sand to rock. Nice work on the new Barracks. I do have some trouble seeing a lion's head in it. Looks more like a cool alien-snake-monkey-combo. Oh, well heck man! If you wanna add those to a new tileset or something, I'd be more than happy to put those tiles in somethin' for ya. Aye, it's different. If you wanna try your hand at it and make your own Golden Lion Barracks sprite, I'd be very happy to see what you'd come up with! Otherwise, I've only got what I've got. That's interesting (I also saw your dev) good job.